Okra is an ideal vegetable during Ramadan as it has many minerals, vitamins and fibre. Okra cooks quickly and is inexpensive. 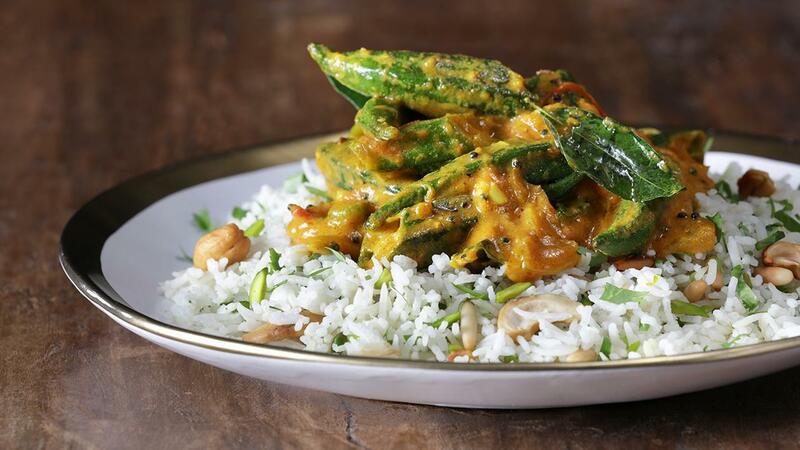 Use more Okra this Ramadan. Top and tail the okra and cut to your desired size. Sauté in a wok or frying pan the onions, garlic, ginger,chilli paste, cinnamon and bay leaves. Add the okra and cook until slightly soft or bright green. Add turmeric, garam masala and a few minutes after the Knorr Tomato Puree, cook for a few minutes until curry takes shape. Add in Knorr Chicken Stock Powder dissolved in hot water and continue cooking until okra is tender. Close to the end add the Kasuri Methi and yogurt. Dissolve Knorr Chicken Cube in hot water before adding to the rice to steam until fluffy. Only add the nuts after cooking. The nuts should be lightly toasted. Heat the oil and toss spices andchilli to release flavours, use this to pour over the curry just before serving.